Grab bars provide assistance when bathing or using a commode. Meet ADA requirements. Features gentle rippled texture designed to enhance grip in wet and slippery conditions. Designer bars are also available to match your bathroom decor. Professional installation is required. Alerts caregiver with audio alarm when patient gets out of a chair or bed. Pressure sensitive pad connects to the audio alarm. High visibility combined with a magnetically activated alarm creates an effective deterrent to wandering. Arresting yellow banner and brilliant red stop sign features an alarm with on/off switch, high/low volume switch, low battery indicator. 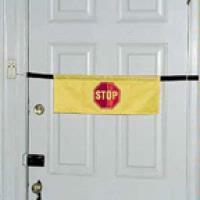 Attaches to door with hook and loop. Natural ash finish wood cane with round handle provides additional support and can help improve balance, reduce stress and pain of lower limbs by shifting the weight to the arms and upper body. Weight capacity: 250lbs. Sturdy, comfortable, and made to last. Features contoured handles with foam hand grips that provide a comfortable, secure grip, complete with convenient wrist strap. Handle adjusts in one inch increments from 29" to 38". Secured with a locking ring for added safety. Weight capacity: 250 lbs. Designed for use by individuals with mobility and balance disabilities, with lightweight design and low center of gravity for stability and balance. The handle rotates for left- or right-hand use. The height can be adjusted from 29" to 38". Weight capacity: 300 lbs. Extra support for those who sit for long periods of time, this cushion uses gel flotation for extra support. Padded with hand grips that assist in the safe transfer or ambulation of patients. Also helps prevent caregiver back injuries. The "fix lock" type buckle enables the caregiver to quickly and easily release the patient from the transfer belt. Engineered furniture grade laminate hardwood frame. Quiet & smooth lift system. Heavy duty lift actuator & scissors mechanism. Standard head and arm covers. Standard, large dual pockets. Lightweight multi-purpose reacher designed for all uses. The textured tips provide non-slip gripping for all surfaces. Designed for ultimate safety with no sharp edges to cause pinching. Suction cup reachers also available. Sizes available: 20, 26 or 32". Built in handle to assist in folding and storage, sturdy seat with soft flexible backrest, adjustable handle height, ergonomic hand breaks, adjustable seat height, solid rubber tires, removable basket and clear plastic tray. Weight capacity: 300 lbs. Three-wheeled rollators provide convenient mobility for a wide variety of individuals. They are specifically designed for stability and comfort while walking. These practical walking aids offer increased flexibility to perform daily activities in a less fatiguing manner. Weight capacity: 250lbs. With its innovative lightweight design, the Rollite offers a flip-up seat with a built-in handle, flexible backrest, ergonomic dual paddle folding mechanism and hand brakes. Weight capacity: 300lbs. 4 Wheel Green Junior Rollator offers the perfect blend of style, comfort and affordability. This rollator comes with easy-to-operate hand brakes, seat, padded straight back, and easy folding for transport. It offers a low seat-to-floor height at 19 1/2". Weight capacity: 300lbs. Center wheel drive technology enables effortless maneuverability and performance both indoors and out. Seat height is adjustable. Weight capacity: 400lbs. An electric stair lifts offer peace of mind and significantly increase mobility to upper levels of one's home. Contact us to learn more about our full line of stair lift options. Walkers with easy, single button press to fold or lock walker in place. Walkers are available in a variety of sizes from pediatric to bariatric. Weight capacity: 300 lbs. Height adjustment: 32" to 36". Attaches to the walker with Velcro. Includes a handy tray to prevent items from slipping through basket. Plastic tray insert includes cup holder. 14 Gauge cross braces add strength and durability. Dual, low maintenance triple chrome-plated carbon steel frame is long lasting. Offset permanent arms available in 16, 18, 20, 22 and 24" widths. Powerful two-motor, patented mid-wheel drive design offers outstanding maneuverability. Low center of gravity design delivers a smooth, stable ride. Weight capacity: 250lbs. This lightweight aluminum transport chair comes with fully padded arms, a fold-down back and swing away footrests. It also has an attendant operated wheel lock for easy use. Weight capacity: 250 lbs.